A triple bed room suitable for families and small traveling groups with a great view over Huet Square and the Catholic Church . This twin bed room is designed with typical Saxon furniture. In Transylvania this old craft has been passed on from generation to generation and Casa Luxemburg has preserved this old fascinating design to take you back in time. This double room will enchant those who enjoy this kind of art form. For the short term traveler who needs a good night’s sleep in a cozy setting this room is perfect. While smaller than other rooms, you can still enjoy a mural painting after Grigorescu and a great view of the Evangelic Cathedral. 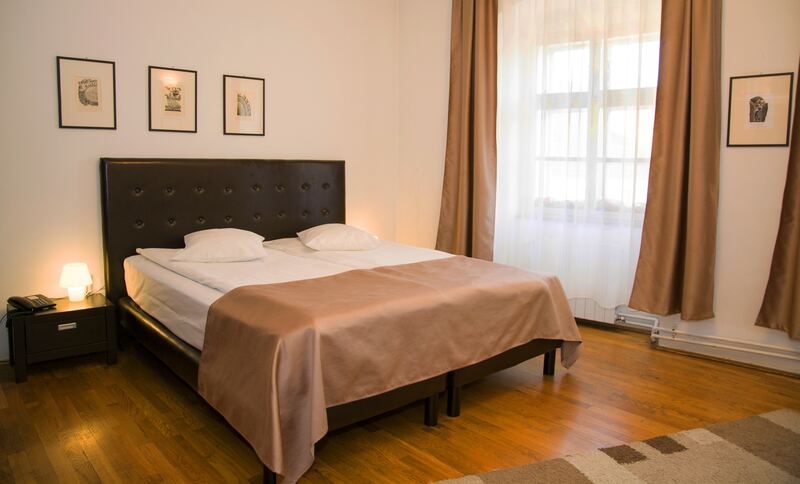 A modern furnished apartment offering the space needed to relax and enjoy the great views of the historical center, Piata Mica with the Liars’ Bridge, the Council Tower and the House of Arts. This two-room apartment has a cozy king size bed and a folding bed in the second room. It is perfect for families with children and not only. This apartment is made up of two rooms, one kitchen and a big bathroom. It offers you the space needed to feel right at home and gives you the opportunity to enjoy the picturesque views of the Piata Mica with the Liars’ Bridge as well as those of the Huet Square with the Evangelic Cathedral. It is the perfect choice for long term travelers, families with children or a romantic getaway.